A fitness or activity tracker is a modern and useful way of keeping track of your fitness goals, physical activity, and so much more. Like most products, all trackers are not created equal, and you may be surprised at the wide array of capabilities and styles that currently exist for this product. You might also be surprised at the price range that exists for these trackers as well, as you could obtain a decent one for less than fifty dollars or spend several hundred or more. Regardless of the price tag, the best fitness tracker for you will be the one that suits the level of activity for which you are striving, integrates easily into your lifestyle, and meets your style and comfort preferences. Those in the market for a fitness tracker should carefully consider their current activity level, as well as future fitness and activity goals. Are you a person who could benefit from extra motivation and visible progress notifications and updates? Or, are you simply looking to keep track of how many steps you take in a given day? You may be concerned with a specific style or brand name that has been recommended to you, however the best fitness tracker brand for you will be the one that helps you achieve your own specific objectives. The fitness trackers of today span from basic to sophisticated, with a whole host of price points as well. It is easy to feel overwhelmed by such vast options, but we are making it easy for you. Follow along to learn which important features to consider and read our reviews for some of our top choices. We will have you well on your way to finding the best one for you and your active lifestyle. 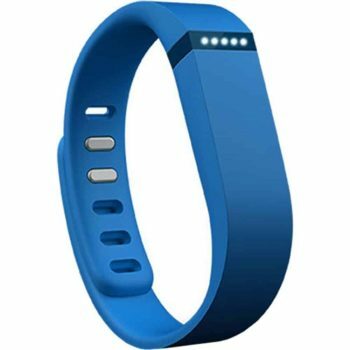 Most fitness trackers have a wrist strap and can be worn like a watch, but some have clips that enable them to be worn on clothing or as part of other jewelry or accessories. Options available nowadays span from everything from large, utilitarian style bands and screens to devices with no screens that would never even hint at what they actually are. Many options are also customizable, and offer bands in a variety of material and color options, which can be changed to suit your needs. Whatever you choose, the most important style aspect will be a look that blends easily with your daily wardrobe, especially if you plan to use it as an all-day, everyday tracker. Display Options – Screen or No Screen? Generally speaking, the fitness trackers that keep track of the most in-depth and detailed information feature a screen to show you real-time updates and notifications. Alternatively, some devices feature no screen at all, and may appear just as a simple design with or without LED lights that serve as a type of scoreboard to show you progress toward your daily goal. Whether the device has a screen or not, most all of them can be synced with computers and smartphones for further analysis and tracking of your data. The more advanced devices will allow you to set and track right from the screen itself, while the more basic variety may depend on the synced device to enable these features and options. A helpful tip to keep in mind as you compare options is to preview the app that is associated with the device to check out how user friendly and reliable it is known to be. Also, don’t forget to make sure the app (as well as the tracker itself) is compatible with the smartphone or tablet you plan to use it with. All trackers have some degree of error, but some are designed to be more precise than others. They all use algorithms to keep track of the number of steps taken, hours slept, etc. If you will use the device for serious training, you will want to purchase one that is the most specific to that function, although none are considered foolproof. Also, most devices track your heart rate through the wrist, but some allow the added ability to sync with chest strap monitors, which are known for being more precise for that function. Many devices feature a rechargeable battery, although some have batteries that need to be replaced periodically. Battery life is dependent upon the features of the device, and how often you use it – but can be expected to span from one day or less to even six months or more. Obviously, a device with a touchscreen and more sophisticated features will have more sophisticated battery needs. If you choose a tracker without a rechargeable battery, you will also want to consider how often the batteries will need to be replaced, and how much they cost. Even if you don’t plan to swim with your tracker or even wear it in the shower, you will still want to consider the degree to which it is waterproof. You may not think you will encounter water when you work out, but what about when you work up a heavy sweat? It is important to research this feature and know what to expect, and whether or not the product’s warranty will account for damage done by unexpected contact with water. Now that you know some of the most important features to consider, continue on to read our reviews of some of the best fitness tracker brands available today. 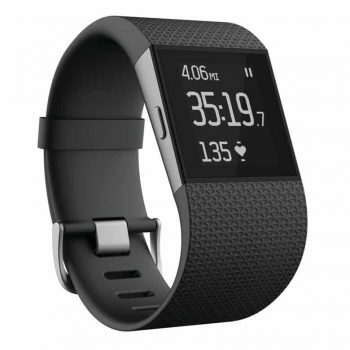 Description: The Fitbit Surge Watch is a one “super watch” that was custom designed to help you perform at optimum levels no matter what type of adventure you embark on. It has GPS, heart rate monitoring, and the ability to track a wide array of sports and activities to measure and track your progress and make the most of your time. It also ensures you stay connected with text and call notifications. It can even detect when you are sleeping, and let you control your music. It can automatically sync to your computer or most smartphones so you don’t have to take the extra steps to record your stats. Like other Fitbit watches, this watch has become one of the most popular options available for fitness trackers, however, you will want to keep in mind some of the top complaints from other owners. With regards to the size of this watch, it is a bit more bulky than some of the other options available, and it has a tendency to catch on jackets or other long sleeved clothing. The GPS component of this watch is what puts it at a higher price point, and it does offer fewer options than some of the other competition in its price point. Overall, this super watch offers everything you need to track and stay on top of your goals, no matter what they may be. The watch is sleek and attractive, and eliminates the need for bulky chest strap heart rate monitors, unless you prefer a chest strap for improved accuracy, in which case that can also be synced with the watch itself. However, take note that some users have reported difficulty in getting the monitor to sync with the chest strap or other accessories. There have also been complaints with regards to the clasp on the wrist strap being difficult to fasten, which can cause it to tear under certain conditions. 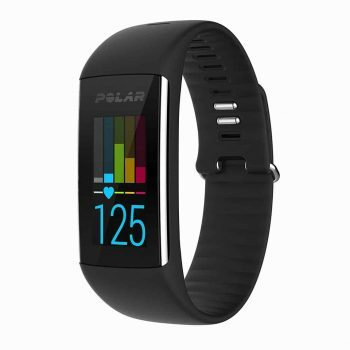 When used in conjunction with the Flow App from Polar, this watch can track your activity 24 hours a day and help motivate you to stay committed to both your fitness and sleep goals. It is also waterproof, which enables you to use it worry-free for swimming or on a long run that leaves you drenched in sweat. Able to connect to your smartphone via Bluetooth, it also ensures that you stay up to date with incoming calls and text messages. It includes a Micro USB Cable for charging and syncing data when connected to a Mac or PC. Description: This Garmin Vivoactive Watch is designed to help you live and work better with built-in sports apps to help motivate you and keep you active. Like most other top fitness trackers on the market, it also helps you stay connected to your work and social life by giving phone and text message notifications if synced with your smartphone. It also features a high-resolution touchscreen that is designed to be visible even in direct sunlight, but some users have complained that the back lighting on the screen is too dim, and that there are a few glitches with the touchscreen feature. The screen itself has a very thin profile, at just 8 millimeters, which makes it comfortable and easy to stay connected night or day. 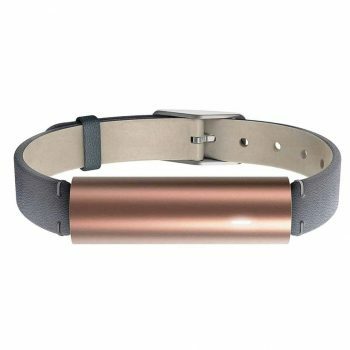 It also boasts an extra-long life rechargeable battery that can last for up to three weeks in activity tracking/ watch mode or 10 hours in GPS mode. The device comes with a very detailed instruction manual, which could overwhelm some users, especially those without experience with this type of product. In which case, it may be helpful to view how-to videos on YouTube to help you get started. 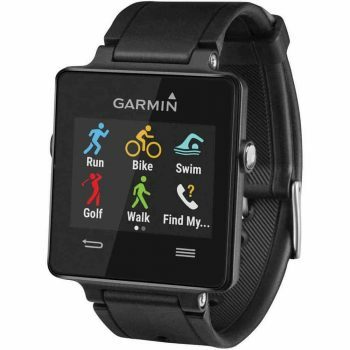 All in all, this is a solid device and is synonymous with the quality for which Garmin is known. Related: Customers also bought the Garmin Vivoactive Screen Protector. The screen protector has been designed in such a way that it allows your fingertips to glide with ease as you use your phone or tablet. The materials used have gone through great processes that enable it to minimize friction. Unlike many other similar products, this device does not have a rechargeable battery, but instead it is equipped with lithium batteries that lasts up to six months. Some prefer this option, as it eliminates the need to constantly recharge it, but there is extra effort and cost involved in battery replacement. It resists water for up to 50 meters. The Ray has hidden spring bars that allow it to be customized and worn with any standard watchband, bracelet, or necklace. Many people find the slim design of this device to be more comfortable and stylish than other such products with large screens. All in all, it is a simple yet versatile tracker available at a reasonable price. Related: For ultimate usage the customers who bought the Misfit Ray Tracker also bought the HWHMH Replacement Wrist Band Strap for Misfit. This is only a replacement band and not an actual tracker. The bands come in various colors to provide you with a wide variety of choice. The specially designed wrist band comes in a size that can be adjusted in accordance to the size of the one having it on. Description: Although much smaller and more compact than other such devices, the built-in wrist GPS on the Garmin Vivosmart HR Activity Tracker lives up to the reputation for which Garmin is known. It is also fully waterproof, and can be worn when swimming or showering without worry. It can also be used in conjunction with the Garmin Connect App to customize notifications and settings, and to sync tracking information and other stats with smartphones and other devices. You can also set it up to receive notification of texts and calls. The touchscreen display is always on, and is even readable in sunlight, although some users have reported difficulty with reading it in the dark. The device does have backlighting, but it is still difficult to read without much light available. Some users have also reported that the stair climbing tracker seems inaccurate, but most all other features of this device perform solidly and reliably well. 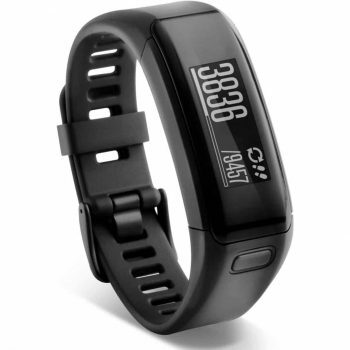 Overall, this is a great option for those who seek a more compact, attractive tracker that can be used for fitness purposes, but also for everyday motivation and casual health monitoring. 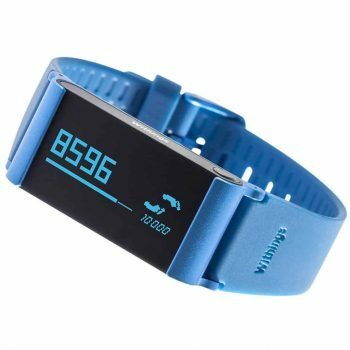 Related: In order to have the tracker perform for a long period of time and in an efficient manner, customers also buy the Garmin Vivosmart HR Screen Protector. This screen protector has an indestructible film with self healing technology. It is UV resistant and tough to withstand any pressure. 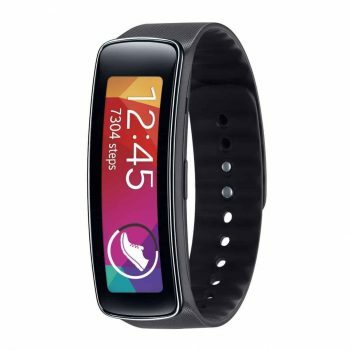 Description: This Samsung Gear Fit Smart Watch features a touchscreen that curves around your wrist, stays charged for up to 4 days, and includes a gyroscope, heart rate sensor, and easily changeable bands for custom style. It also provides customizable coaching to keep you motivated and help you stay on top of your fitness goals. It is also dust and water resistant, and offers a wide array of background colors and wallpapers for further customization. Like most competitors on the market, this device can help you stay connected to phone calls, emails, and text by easily synching with your Galaxy smartphone or tablet, so if you are not a Samsung Galaxy user, this tracking device is not the one for you. Most users enjoy this device and appreciate its relatively low price tag. However, a few common complaints include that it quickly drains the battery of any phone to which it is connected, and that is on the smaller side, which could pose a problem to those with larger wrists. Others have reported problems with keeping it fastened, especially when engaged in intense activity. Related: To get maximum satisfaction, customers also buy the Withings Wireless Blood Pressure Monitor. The monitor has high accuracy blood pressure monitoring as well as automatic wireless sync with withings health mate app. It has dual connectivity that is via Bluetooth or wired. It is compatible with android and iOS. Description: The Fitbit Flex Wireless Tracker is another of the more stylish, slim, and screen free options available when it comes to fitness and activity tracking. It is capable of tracking any and all activity throughout the day, including steps walked, calories burned, and total minutes of activity. However, some users have noted that it performs best for tracking walking or running (due to the way the accelerometer multiplies stride length by number of steps) and therefore, other workout activity reports can be inaccurate. It also allows you to set daily goals and track them through a series of LED lights that light up as you approach your goal for the day. At night time, it continues to monitor your body at rest and can wake you up with a silent alarm that vibrates. The fit is designed to be very comfortable and natural so that you will not even notice you have it on, and is also water-resistant. The battery can last up to five days, and it is easily syncable to computers and over 150 smartphones so that your stats are easily accessible and can be viewed in graphs or charts. Description: Although it is able to track steps, distance, calories burned, heart rate, blood oxygen levels, and more, the Withings Pulse O2 Tracker is the only one on our list that is not waterproof or sweat proof. 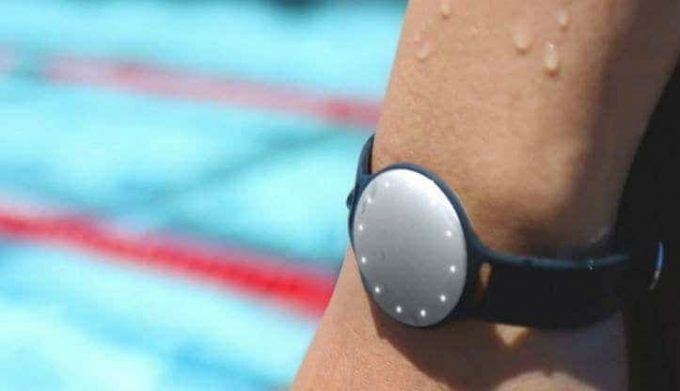 This detail will likely immediately eliminate it as an option among those who are looking for a true activity tracker that can keep up with the most active of lifestyles, certainly not one that includes a lot of time in the water. Like other devices of this nature, it can be synced wirelessly to your computer or device to use in conjunction with the app to track goals. However, it does not itself notify you when you have met your daily goal, which makes it less motivating than other, similar devices that do monitor your goal and notify you of your progress toward it. Overall, this device is a reliable activity tracker that is relatively easy to use and sync with other devices, as long as your activities do not include water. Related: Because other customers are often reactive to the material of the wrist band, they often but the Replacement Bands & Metals Clasps for Samsung Galaxy Gear Fit. They come in a total of 6 bands of different colors. They have no tracker or any other parts on them. They are of high quality and their design makes them to be very attractive. We have explained some of the most important features to consider, and reviewed some of our top choices for fitness trackers. As you can see, just about one of the only things trackers cannot do for you is complete the activity itself! Just like other fitness equipment, it will only benefit you if you take the time to learn it and actually use it. Hopefully this article has made you feel less overwhelmed by the options that exist, and has prepared you to get out and evaluate them for yourself. Keep in mind that regardless of what anyone else tells you is their brand of choice, it will not be right for you unless it is capable of meeting your own needs in terms of budget, style, and capabilities. We would love to know how you feel about fitness trackers. Have you used one before? If so, which features are most important to you, and how has it helped you optimize your lifestyle? Let us know by leaving a comment below!